Today is day 3 in the Rocklands. We’re staying at a farm called DePakHuys near the town Clanwilliam, about 3 hours North of Cape Town. 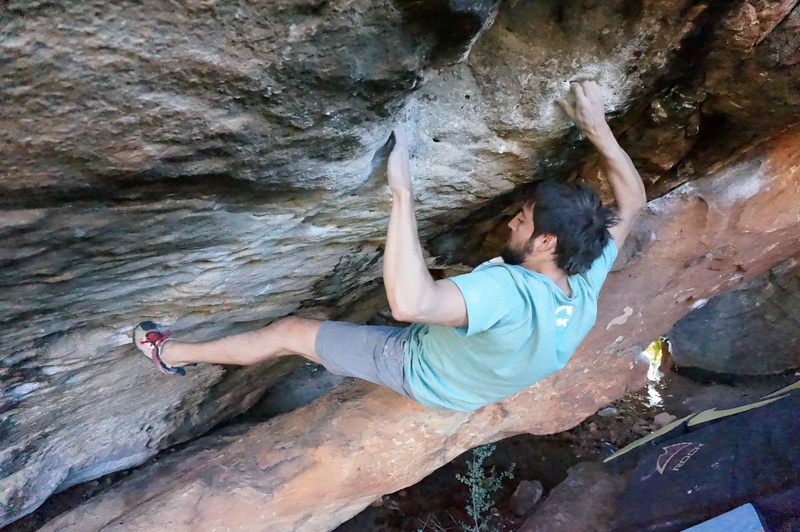 DePakHuys Farm grows Kalamata Olives as well as running the campsite and owning a piece of land with some of the best bouldering in the world. Camping and climbing here doesn’t make you feel like you’re in a another world a thousand miles from home. The campsite is quite nice; there’s showers, bathrooms, wifi, a kitchen, a large fire pit and a bar. Everyone here is a climber, most are on 2 or 3 month trips to climb. A pretty big chunk of them are Americans, sprinkled in with some South Africans, and Europeans; but everyone speaks English. In 2 days of climbing, I already am forced to conclude that this is the best bouldering I’ve ever done. All the lines seem to be classics. The rock is a mixture of sandstone and quartzite and has really great friction. Yesterday we climbed at three different areas, all with completely different features. The variety of styles is definitely what makes this place such a draw to climbers from all over the world. Meat is the main dish here so dinners are usually a lamb or steak cooked over the braii along with a local wine, which can cost you upwards of $3. It’s the life. ***update: the cake was delicious.